Former Cowboy Josh Brent was sentenced to 180 days in jail and 10 years of probation. 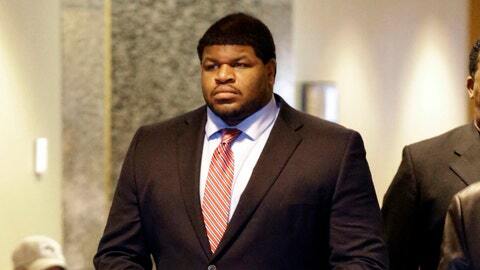 DALLAS — Former Dallas Cowboys player Josh Brent avoided prison Friday and instead was sentenced to 180 days in jail and 10 years of probation for a drunken car crash that killed his friend and teammate, Jerry Brown. Brent was convicted Wednesday of intoxication manslaughter for the December 2012 crash on a suburban Dallas highway that killed Brown, who was a passenger in Brent’s car. Brent could have been sentenced to up to 20 years in prison. Brent, who turns 26 next week, closed his eyes when the judge read the jury’s verdict. He remained in custody after the hearing. One of his attorneys, Kevin Brooks, described the former defensive tackle as "somber." "I’m really kind of overwhelmed with the results," Brooks said. "It’s kind of what we’ve been fighting for from Day 1. I’m happy for Josh. Josh is still sad and grieving and that’s something he’s going to carry with him the rest of his life." Brent’s family members of cried and hugged as the courtroom emptied after the hearing. His mother, LaTasha Brent, spoke briefly as she left the courthouse, saying she was there to support her son. Brown’s mother, Stacey Jackson, wasn’t in the courtroom when the verdict was read. She publicly forgave Brent, and when asked during the sentencing proceedings if she holds him responsible for her son’s death, she said: "He’s still responsible, but you can’t go on in life holding a grudge. We all make mistakes." Brent and Brown, a linebacker on the practice squad, also played together at the University of Illinois and were close friends. They were headed home from a night of partying with Dallas teammates when Brent lost control of his Mercedes and crashed. Officers who arrived on scene saw Brent trying to pull Brown’s body from the wreckage. Blood tests pegged Brent’s blood alcohol content at 0.18 percent, which is more than twice the state’s legal limit to drive of 0.08 percent. Prosecutors told jurors that the burly, 320-pound lineman had as many as 17 drinks on the night of the crash. "We never quarrel with a jury’s decision," said lead prosecutor Heath Harris, who passionately urged the jury to send Brent to prison. "All we can hope and pray is that I believe the jury saw something salvageable in him … and he does get some help." One of Brent’s attorneys, George Milner, argued that Brent wasn’t drunk and was only "guilty of being stupid behind the wheel of a car." He contended that Brent couldn’t have had nearly as much to drink as prosecutors said he had, and that the police blood tests were flawed. Brent’s attorneys pushed their case for probation Thursday, calling a Dallas County official who testified that the county currently has 34 intoxication manslaughter cases that resulted in probation. Prosecutors pushed for prison time for Brent, who went to trial only weeks after another Texas intoxication manslaughter case sparked widespread public outrage. In that case, a defense expert argued that the defendant, a 17-year-old boy who caused a drunken crash that killed four people, deserved leniency because his parents coddled him into a sense of irresponsibility — a condition the expert termed "affluenza." The teen wasn’t given prison time. On Thursday, prosecutor Rebecca Dodds emphasized Brent’s 2009 drunken driving arrest in Illinois to press the state’s argument that he deserves prison time. In that case, he served 30 days in jail after pleading guilty to a misdemeanor charge. "Probation doesn’t work for Josh Brent," Dodds told the jury during closing statements in the punishment phase. Brent, who retired from football last year, played in all 12 games for the Cowboys in 2012 before the crash. Brown made the practice squad that season.